The Texture Of Things » Someone promise me there really will be a day when she keeps a single pair of underpants dry all day. Someone promise me there really will be a day when she keeps a single pair of underpants dry all day. Many thanks to Lee’s Doodles for speaking the truth. 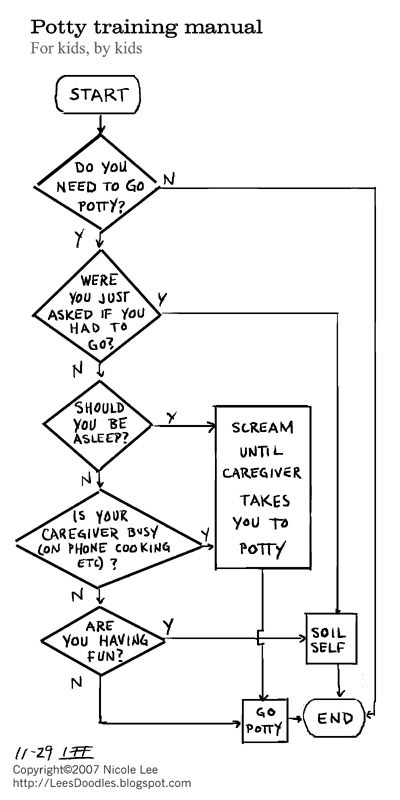 I can follow that flowchart. I was so engrossed in following it I forgot to go to the bathroom soooo…..
Be back in a minuret, as soon as I change my pants. Hah! I like your suggestion! H.G. : Truer words were never spoken….